NEW YORK, NY (April 26, 2017) — EdSurge and Shindig today announced plans for interactive Thought Leader Interviews at the 2017 ASU GSV Summit on May 8-10 in Salt Lake City. The interactive interviews are intended to connect educators and talent developers in schools and companies across the nation with the Summit presenters and participants. Shindig’s video chat teaching and events technology will power the three-day series. The interactive Shindig platform will allow EdSurge moderators CEO and Founder Betsy Corcoran, senior editor Jeffrey R. Young, and managing editor Tony Wan and more than a dozen interview participants — education and talent leaders, corporate executives, college officials, and education researchers — to engage directly with the online audience. The annual ASU GSV Summit brings together educators, human resource leaders entrepreneurs, business leaders, policymakers, philanthropists, and university and school district leaders to create partnerships, explore solutions, and shape the future of learning and talent innovation. This year’s program features more than 400 tech companies discussing how learning and talent innovation are inextricably linked to meet the future needs of our society. “Stories—genuine stories—really matter. We’re excited to be helping tell the authentic stories of the people who are building the technology that supports innovations in teaching and talent,” says Betsy Corcoran, CEO and Founder of EdSurge. The growing list of confirmed interview participants includes: Sean Gallagher, director of the Center for the Future of Higher Education & Talent Strategy at Northeastern University, Candace Thille, assistant professor of education at Stanford University’s Graduate School of Education, Rufus Glasper, CEO of the League for Innovation in the Community College, Rachel Romer Carlson, CEO of Guild Education, Todd Rose director of the Mind, Brain, & Education Program at the Harvard Graduate School of Education, Matthew Pittinsky, CEO of Parchment, and many more! “We are delighted to be working with EdSurge and Shindig. These interviews are an important component of our efforts to elevate innovation leaders in learning and talent development to extend the reach of their ideas,” said GSV Managing Partner Deborah Quazzo. Shindig’s unique technology will also enable online participants to discuss, network, and socialize privately with one another as if they were attendees at the ASU GSV Summit. EdSurge will host the interactive interviews on EdSurge.com. 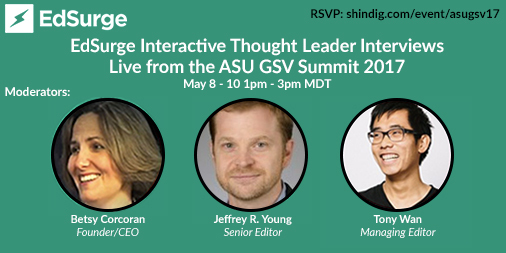 The interactive Forum conversations from the ASU GSV Summit will also be archived at EdSurge.com for access after the Summit. The live, interactive interviews will take place from 1:00 pm – 3:00 pm MT (3:00 – 5:00 ET) for three days, from Monday, May 8th through Wednesday, May 10th. The interviews will be available for free on any web connected device, computer, tablet, or phone. To participate in the online interviews via mobile device please download the Shindig mobile app, titled Shindig2 Pro, in Apple or Android app stores.